It's official. Tomorrow is September! For whatever reason, I feel like August went by more quickly than all the other months so far this year. September is going to be both awesome and challenging, as I simultaneously count down to the day I get to marry my best friend and squeeze in a ridiculous amount of planning while this best friend is back on the road with the band. (Are you guys sick of hearing about this yet???) With the arrival of fall, there's a whole lot of work to be done with my businesses too. I'm looking forward to September though, and have all sorts of fun posts planned for this month, as well as some really great guest posts lined up for the week leading up to my wedding. 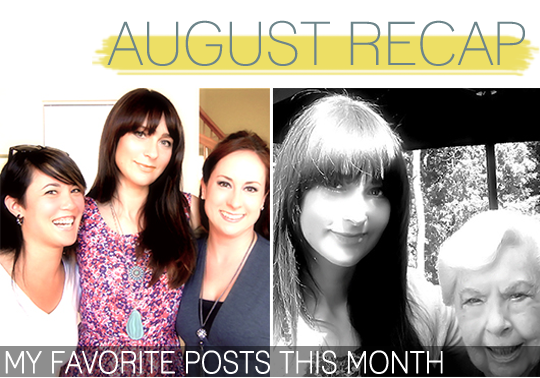 To bid a fond farewell to August, I thought I'd take a look back at some of my favorite posts from the past month. If you missed any of these posts and want to check them out, just click on the images or links. What are your thoughts on September? Are you looking forward to it, or pining summer's end? GREAT round-up! I missed a couple of these and can't wait to read them with a cup of tea when I get off work. August flew by for me too, actually the whole summer did. Hope the rest of the wedding planning goes smoothly and is not too stressful! 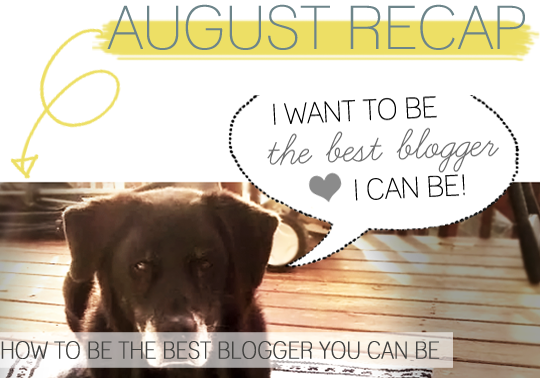 Great posts :) One of my favorites was the "being the best blogger" post. I feel like I'm glad August is over--it wasn't bad really but bumpy I guess. I'm looking forward to September for a few reasons. 2. Mid september is officially fall and I love the season (even tho I live in FL) and I'm determined to put out fall/halloween decor this year!! 3. Some of our patio garden vegetables will be ready soon to eat! YUM! 4. My bf David and I are trying to plan a weekend getaway at the beach before it gets too cool (which in FL we probably have plenty of time). Really loved the jar lights! I'm so ready for september and fall!! Thanks you guys! Lindsay, looks like you have a great month coming up!